Aloha! One quick update on the farmers markets this week — The Blaisdell Farmers Market on Wednesday is canceled, so we won’t be there. However, we will be all set up and ready to serve on Thursday, February 1, in Kailua and Saturday morning, February 3 at KCC! As always, you can view the entire schedule and menu over at the Farmers Market page. Join us at Piggy Smalls for our first collaboration dinner with New Belgium. $75 (excludes tax and gratuity) for four courses paired with selected New Belgium's beer. Don't miss out on this, call us at (808) 777-3588 to make your reservation. Click here to see the menu! Join us for a special four course dinner paired with Kō Hana Rum cocktails. To make reservations, call (808) 585-8255. Click here to see the entire menu! 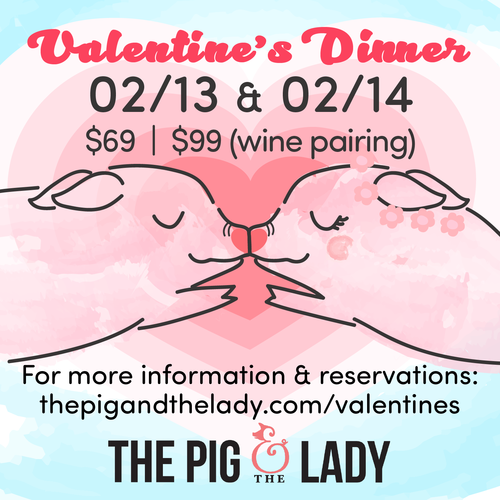 Celebrate with your loved one with us this Valentine's Day. 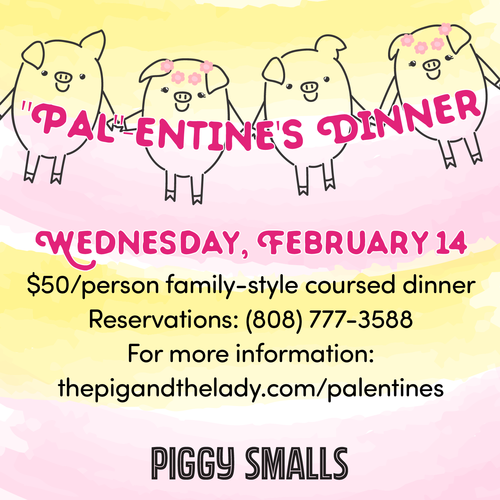 We are offering a special 5 course dinner on both Tuesday, February 13 and Wednesday, February 14. To make reservations, call (808) 585-8255. Click here to see the entire menu! Valentine's is not just about celebrating romance, but spending time with other loved ones and friends! Our special family style coursed dinner is the perfect way to celebrate with your pals! To make reservations, call (808) 777-3588. Click here to see the entire menu!